Now that Apple has joined the convertible don’t-call-it-a-laptop party with the iPad Pro, Microsoft is giving the Surface Pro a much-needed specs bump. Productivity has never been so competitive. The Surface Pro 4 is a direct successor to the Pro 3 (duh), meaning it’s a fully-fledged laptop replacement, with a beefy and capable processor. (That’s less true of the Surface 3, Microsoft’s cheaper, thinner and slower version of the Surface). 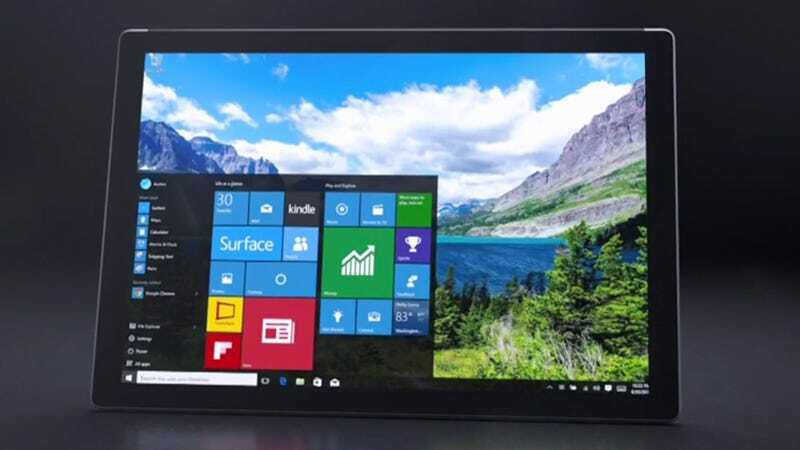 Probably the most significant change is the processor: the Surface Pro 4 has a G5 chipset, designed by Microsoft. We don’t know much about the actual details, apart from that it’s apparently 50% faster than a Macbook Air, or 30% faster than a Pro 3. Specs include ‘up to’ 16GB of RAM and 1TB of solid-state storage, an 8-megapixel rear camera, and a larger trackpad on the keyboard accessory. That’s a good change—I’ve always found the trackpad to be an afterthought on the Surface keyboards. But the insides isn’t the most exciting thing about this new Surface: that would be those bezels, which barely even exist. The Pro 4 has a 12.3” screen, but it’s the same size as its 12-inch predecessor. While things are being shrunk, let’s talk about the body: thanks to a new cooling system, it’s a little thinner: 8.4mm vs 9.1mm for the Pro 3. The screen has a resolution of 267ppi. That’s exactly three pixels per inch more than the iPad Pro, by the way. Also, the Gorilla Glass is the thinnest ever on a tablet, at 0.4mm. Thinner glass is almost always a good thing, because the thinner the glass, the better the touch (and digital pen!) experience. Speaking of the pen: Microsoft’s going all-out with its stylus on this edition of the Surface. The new pen has all-year battery life, interchangeable tips with different feel and sensitivity. Want a stylus that feels like a pencil, or a felt tip, or a ballpoint? Microsoft has you covered. Oh, and finally, there’s a magnetic dock for the pen. In case you needed more new accessories: the iconic Surface keyboard cover is getting an update. It’s the same fabric-style, magnetic-connecting keyboard, but now with a backlit keyboard with deeper key travel. Oh, and because it’s 2015, you get a fingerprint reader. Pricing starts at $900 (presumably without accessories), with pre-order open tomorrow, and full rollout on October 26.